You have to give a measure of respect to General Motors for not entirely throwing the white flag on the European market despite withdrawing Chevrolet from the continent a few years ago and selling off both Opel and Vauxhall to the PSA Group earlier this month. Its presence has diminished substantially, but it’s not completely out of the market yet. The Camaro remains a fixture in some countries across the Atlantic. 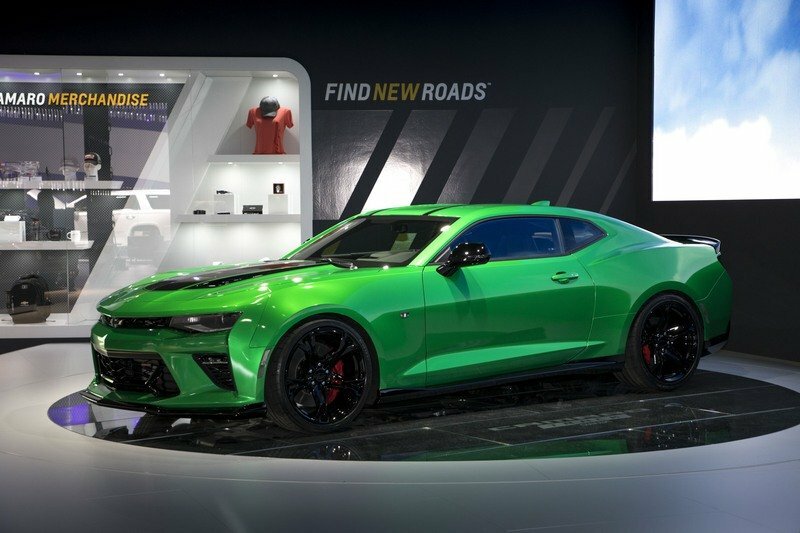 It seems fitting then that Chevrolet’s stand at the 2017 Geneva Motor Show was dominated by one car: the Chevrolet Camaro Track Concept. For the record, the Camaro Track Concept isn’t some new prototype that will usher in a new era of muscle car goodness in the Old Continent. If only that were the case, right? 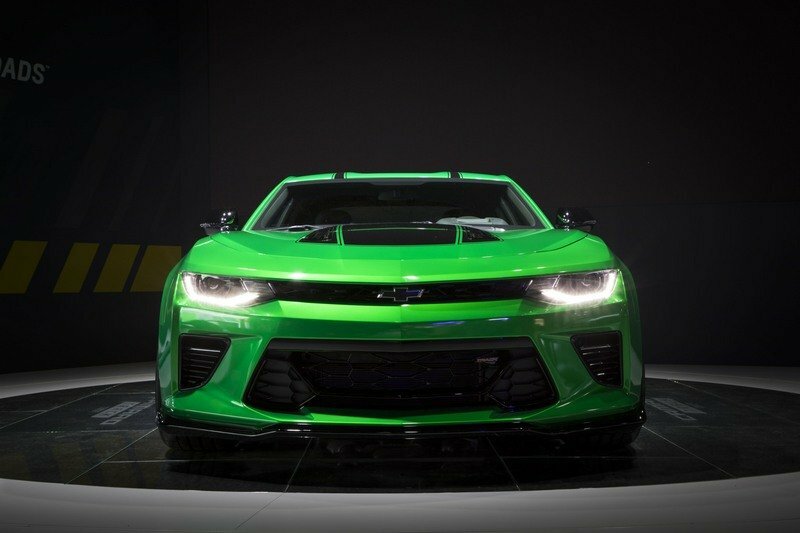 Instead, the concept is, for all intents and purposes, a repackaged version of the Camaro SS 1LE that people from this side of the Atlantic first laid eyes on at the 2016 Chicago Auto Show last August. It may not be as exciting for us here in the U.S. since we’ve already seen it, but in the land where the Camaro itself has become one of the last remnants General Motors’ presence, it’s a pretty darn big deal. So, what can our European friends expect from the Camaro Track Concept? 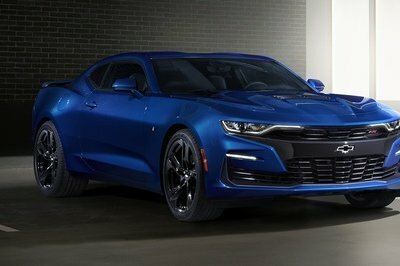 The simplest answer is the Camaro SS, the Camaro variant from which it’s based on. 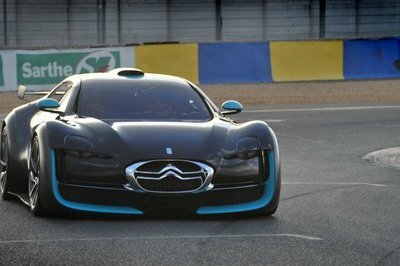 That’s not all though because the Track Concept also comes with an enhanced aerodynamic kit, a new set of wheels and tires, and a handful of cosmetic upgrades that elevate the track-focused muscle car’s appearance. 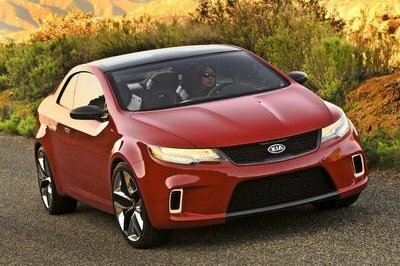 Most importantly, it has engine and transmission upgrades, which should bode well for customers who are looking to really tap into the car’s full performance potential. 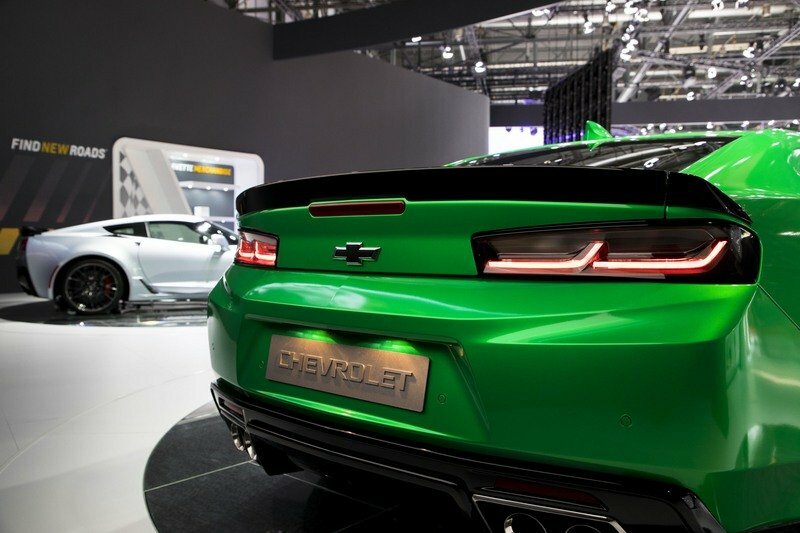 It’s still unclear as to when the Camaro Track Concept will transition from being a concept to a full-blown production model, but there is some momentum towards that happening, especially after Chevy itself announced that a selection of its Chevrolet Performance parts will be made available to European customers in the near future. Continue after the jump to read more about the Chevrolet Camaro Track Concept. From a distance, it looks like your standard Camaro SS, but if you look at it closer, you’ll notice a lot of things about the Camaro Track Concept that a normal SS model doesn’t have. Chief among these add-ons is the aerodynamic kit, which is largely responsible for turning the muscle car into the track-ready beast that Chevrolet is packaging it to be. The front bumper and front splitter have been upgraded to help reduce lift at high speeds. 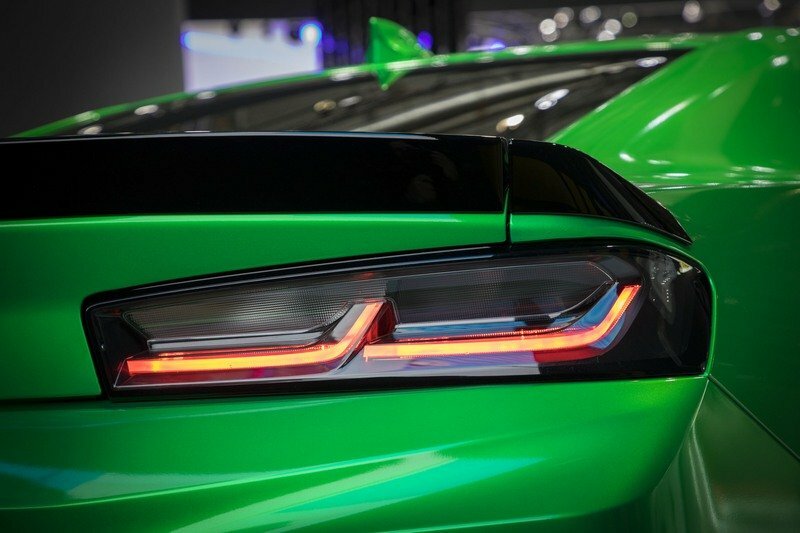 The same thing with the rear bumper, which works in concert with the three-piece rear spoiler to provide the car the necessary downforce to help it run smoothly on the track, especially in tricky and tight corners. Chief among these add-ons is the aerodynamic kit, which is largely responsible for turning the muscle car into the track-ready beast that Chevrolet is packaging it to be. 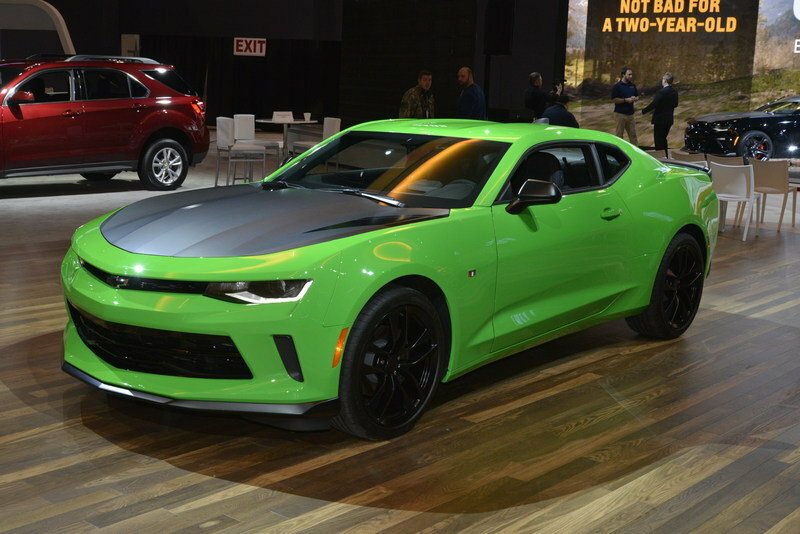 On the cosmetic side, the track-spec Camaro is dressed in a Satin Green paint finish with glossy black stripes running along the hood and roof of the car. 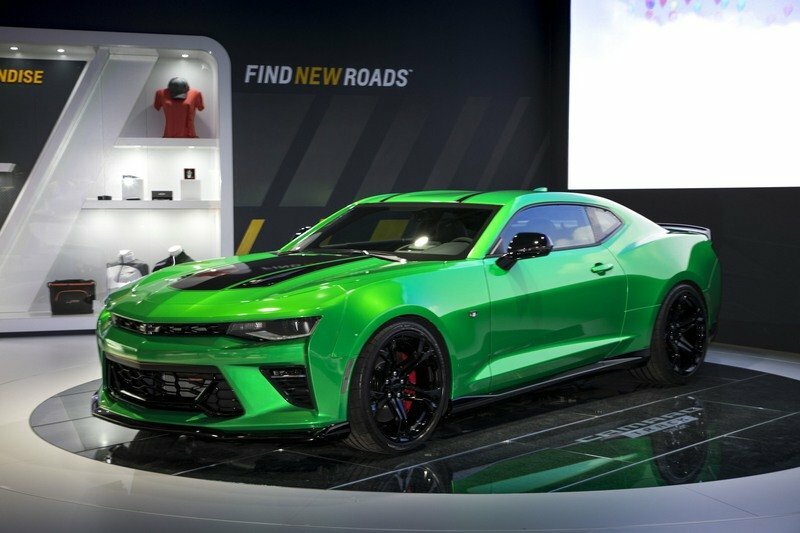 Can’t blame Chevy for dressing up the concept in this garb, especially if the objective is to make it stand out from the standard Camaro SS models. In keeping with that motive, a fistful of bespoke add-ons have also been thrown into the equation, including smoked rear taillights and the ever-present black Bowtie emblems. Last but certainly not least are the wheels, which take the form of 20-inch gloss black aluminum rollers wrapped in Goodyear Eagle F1 tires. 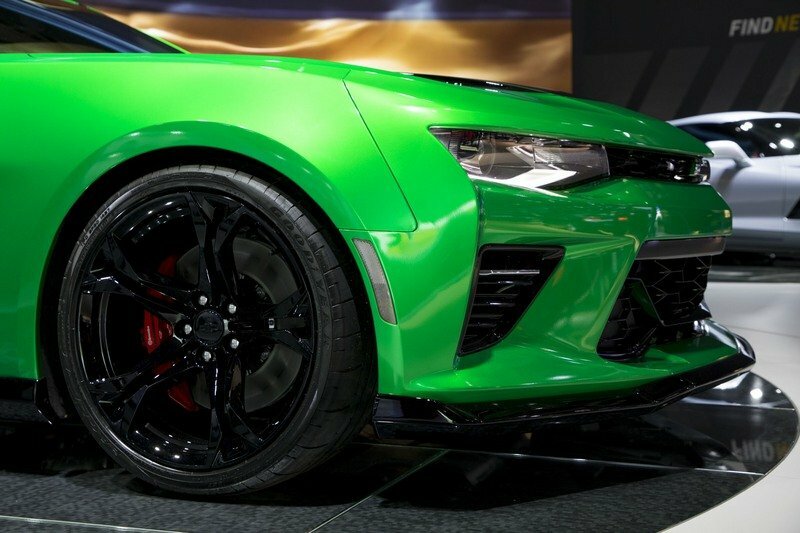 Just behind the wheels are the Brembo performance brakes, which are made up of six-piston monoblock aluminum front calipers with performance brake pads and two-piece, 14.6-inch x 1.3-inch vented and slotted Duralife rotors. If all of these features sound familiar, that’s because the Camaro 1LE that we saw in Chicago back in August 2016 carried some of the same enhancements, right down to the 20-inch wheels and the Goodyear Eagle F1 tires. In place of the standard seats, the track-spec Camaro gets sports bucket seats from Recaro. Move to the interior of the Camaro Track Concept and the exclusive items are just as significant, at least from a physical standpoint. In place of the standard seats, the track-spec Camaro gets sports bucket seats from Recaro. The standard steering wheel has also been replaced with a suede-dressed flat-bottom steering wheel. And just in case the steering wheel isn’t enough, the center console armrest and knee pads have also been given the full suede treatment. Some people might consider the last two items – premium floor mats and aluminum pedals – as afterthoughts, but at least Chevy still has it as part of the package. Now let’s move under the hood of the car where the same 6.2-liter V-8 engine is sitting, ready to dole out all of its 455-horsepower and 455-pound-feet of torque output. The lack of any power upgrades is a little bit of a bummer, but the good news is that Chevrolet mitigated that by adding engine, transmission and differential coolers and an electronic limited-slip differential into the equation. These upgrades won’t increase the car’s output, but they’ll no less help the car become even more composed on the track, which is its main objective in the first place. 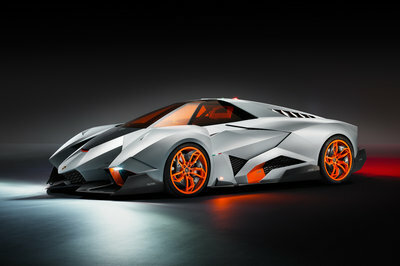 The same 6.2-liter V-8 engine is sitting, ready to dole out all of its 455-horsepower and 455-pound-feet of torque output. Just as important to the identity of the Camaro Track Concept are upgrades to its suspension. Arguably the most important “new component” of the concept is the Magnetic Ride Suspension, which not only opens up the possibility of the car getting lowered by as much as 1.18 inches, but also helps the car improve its overall handling and drivability. It’s hard to notice it when the concept is sitting pretty at an auto show, but when it’s out on the track and cornering like a boss, that’s where the suspension earns its worth. As I mentioned earlier, availability of the Camaro Track Concept is still an open-ended discussion. There’s no specific timetable as to when Chevy plans to unleash it in the European market, but there should be some momentum for the automaker to make that move, especially after the car made quite an impression at the 2017 Geneva Motor Show. Whether that positive reception is enough to compel the Bowtie to give the green light is another question entirely. Making up for that uncertainty, however, is GM’s release of several official Chevrolet Performance parts to European customers. Already offered in the U.S., these speed parts will become available in Europe sometime this year. 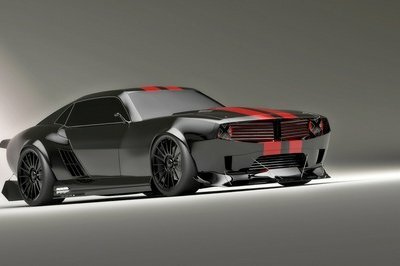 If the Camaro Track Concept doesn’t materialize as a limited-run production model, then Camaro SS owners have something to fall back onto.